Hundreds of residents of Mumbai’s highly-polluted Mahul area gathered on Sunday, on the 15th day of their protest, to form a human chain in order to capture the attention of the Maharashtra government towards the plight of over 30,000 citizens, who were “rehabilitated” here last year. The three kilometres long human chain saw the participation of people from other slums in Mumbai, students of the Mumbai University, Tata Institute of Social Sciences, IIT Bombay, representatives from several civil rights organizations, NGOs and individuals. 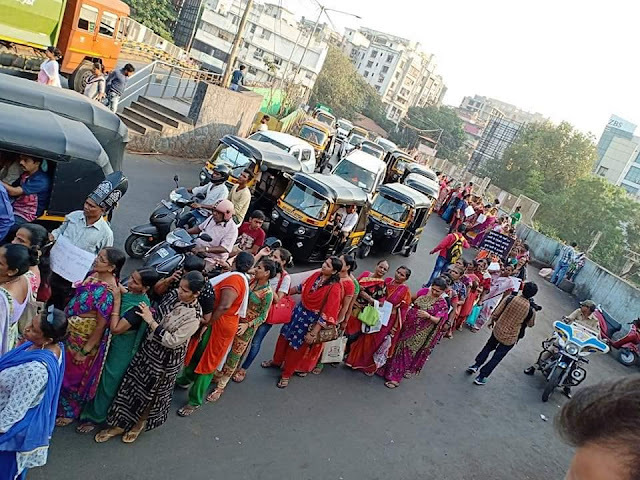 The human chain was followed by a massive rally, which culminated at the residence of state housing minister Prakash Mehta. 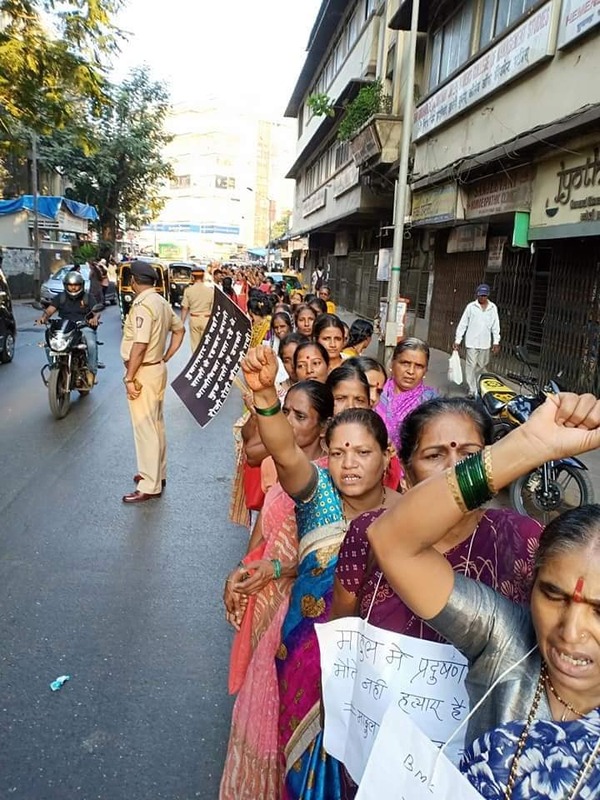 Following negotiations, the minister called in top social activist Medha Patkar, who was present at the rally, promising her that he would meet a delegation of Mahul residents in Mantralaya on Monday afternoon. It is already 15 days since Mahul residents started their protest, but, say protesters, they have not received any concrete answer from government officials and ministers. Mehta till now was refusing to intervene in the matter or take responsibility. Maharashtra chief minister Devendra Fadnavis, too, refused to acknowledge the issue. For Mahul residents, however, Sunday’s human chain signified unity of their resolve to fight till all the demands are met. Citizens began their protest under the banner of Jeevan Bachao Andolan on October 28, 2018, after the state government failed to act on the directions of Bombay High Court, asking the state government to provide alternative rehabilitation to the people living in Mahul. Mahul, which is one of the most polluted regions of Mumbai and is called a “toxic hell” has been made into a rehabilitation space for thousands of citizens by the Slum Rehabilitation Authority (SRA) even after the National green Tribunal (NGT) declaring it as ‘inhabitable’. Families staying in Mahul have reported deaths and severe illnesses like TB, cancer, tumours, etc. spreading among them ever since they started living here. Over 100 people have reportedly lost their life while living in Mahul. People have termed this as a mass genocide by the state government. In its order on August 8, 2018, the Bombay High Court also said that if the state government could relocate Mahul residents by giving them alternate accommodation, they should be offered “enough rent” so that people can go to safer places of their choice. The court set a deadline of October 1, 2018 for the state government to take a decision between the two options. The state government submitted to the court that it was not possible for it to provide any alternative accommodation, nor could it give rent to the people. The state government this say, allege protesters, shrugged off its responsibility to save 30,000 lives. On the issue of providing alternative tenements, the government said that it didn’t have tenements to be given to Mahul residents. As for the other option, the government said that it was “impossible” give rent, but provide any any reason for taking such a stance. Meanwhile, the civil rights organization fighting for Mahul residents, Ghar Bachao Ghar Banao Andolan (GBGBA), prepared a list of more 80,000 tenements which are meant for Project Affected Persons (PAPs) and are located at different locations within Mumbai. GBGBA suggested this is a solution for relocating Mahul residents on an urgent basis. However, with no positive response forthcoming from the state government, Mahul residents were left with no option but to literally come on street to save their lives when they found that the state government has taken off its hand from the tangled issue. They got terrified with increase in unnatural deaths and people suffering from serious diseases. This led to the start of the Jeevan Bachao Andolan on October 28, 2018. GBGBA’s proposal to provide alternative accommodation received partial approval from Shiv Sena, the coalition partner in the Maharashtra government. It decided to come in support of the movement. On insistence of party’s youth wing president, Aditya Thackrey, the MLA and newly-appointed chairman of Maharashtra Housing and Area Development Authority (MHADA) offered 300 empty lying tenements available with it. While the ruling BJP, which has all the portfolios in the government to take a final decision on the issues, is being completely mum, the Shiv Sena is going out of the way to resolve the issue by coordinating with other housing agencies to find out more PAP tenements on the lines suggested by GBGBA. Mahul residents have decided to not take back their agitation, which they started to save their lives until they get confirmation of safe housing to each family living in Mahul. Three hundred houses is like a cumin seed in camel’s mouth as against the demand of around 5,500 houses, they feel.